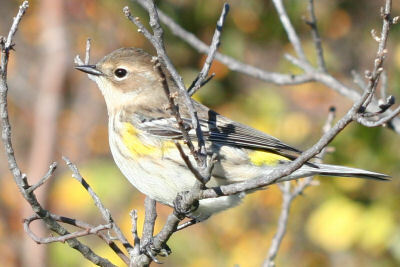 The Butterbutt, or, more properly, the Yellow-rumped Warbler (Dendroica coronata) is one of the most common warblers in North America. The reason for their common name is pretty obvious, but if you need an explanation just look at the little thumbnail to the right. 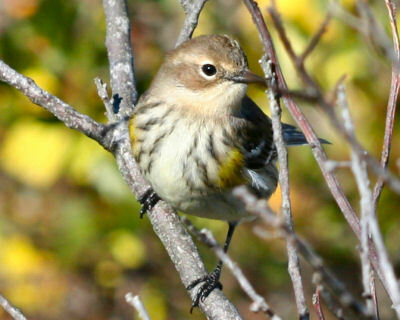 Here in the eastern part of the continent we have the “Myrtle” form of the Butterbutt, easily distinguished from the western, “Audubon’s” form by the lack of a yellow throat, among other less-noticeable features. 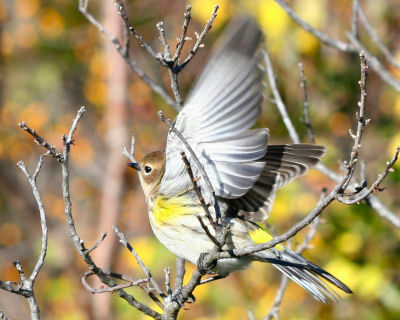 I was fortunate enough to come across quite a few of these gorgeous and fearless wood-warblers, in non-breeding plumage, easily pished in for photographs, on my birding excursion to the barrier beaches of Long Island this past Sunday. Every spring and every fall I eagerly await the arrival of the Butterbutts and then, when I get tired of sifting through one after another trying to find a rarity, I just as eagerly await their departure. I rarely take the time to really appreciate them, even when I find them on their breeding territories in the Adirondacks, which is a shame as they are gorgeous creatures in their own right. Anyway, I took the time this Sunday and I must say I am appreciative of the results! 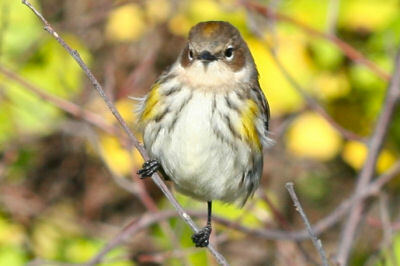 If you’d like to see what Butterbutts look like in breeding plumage click here. I can’t imagine what kind of internet search terms will get people to this post…. And I don’t want to know either. The very idea scares me, Will. And Charlie, a link has been added in the body of the post. 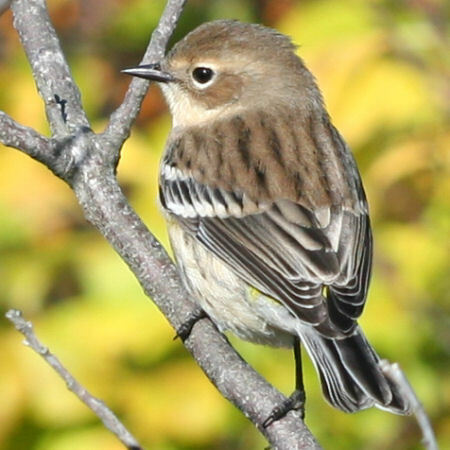 This, as you were able to find out yourself in Germany, is the great advantage of the birder new to an area: being able to appreciate a bird species for how neat it is, not for how rare or difficult or “nemesis”-like. 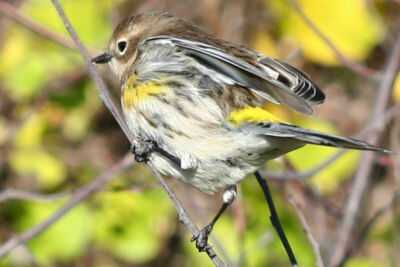 I love Butterbutts and was absolutely shocked that I didn’t get to see one this fall before my departure from Ann Arbor. 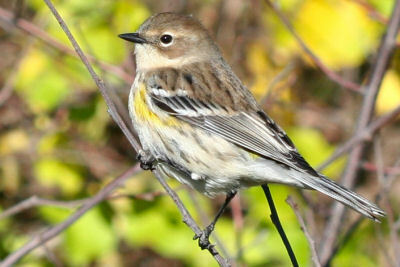 To me, it is the Ultimate Warbler. FABULOUS photos, Corey…can you tell us what kind of equipment you use(d)? I have a Canon SLR with a 100-300 lens but it just can’t get me close enough. Someone suggested a 2X converter for $300 rather than a 600 mm lens at $2000. Any thoughts? @Erin: Thanks! When I took these photos I was shooting with a Canon EOS 20D and a 100mm macro lens. Now I digiscope with my EOS 50D hooked to a Swarovski spotting scope.